Patrick Owens was the son of Patrick and Margaret Owens. He was born on 6th October 1893 in at Cornafanog near Lisbellaw in County Fermanagh. Patrick and the family lived in Lisbellaw. His father was a labourer who died when Patrick was eight. Patrick enlisted at the start of the war and served with several regiments. 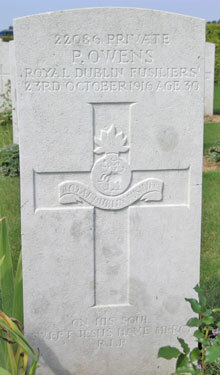 Patrick was at Gallipoli, was injured in Greece, and survived the Somme. Private Patrick Owens was serving with the 1st Battalion of the Royal Dublin Fusiliers when he died of wounds in France on Monday 23rd October 1916.